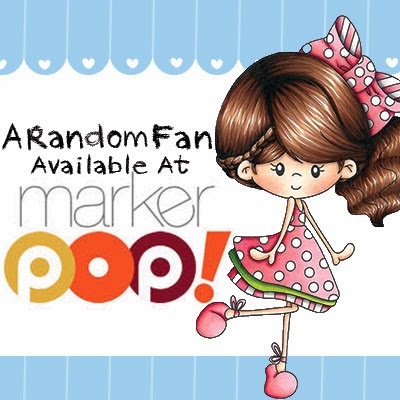 Do you love A Random Fan digis, but prefer the touch of rubber stamps? Look no further because I'm super excited to announce that our line has been added to MarkerPOP's collection of rubber stamps. Bonus is that you can get our rubber stamps plus premium markers, paper pads, and a whole lot more all in one place. They carry just about anything and everything you need to fulfill your crafty obsession. Sometimes it's so hard to contain yourself when you're browsing. Just warning you guys it will take a whole lot of self-control to browse and not make a purchase. Okay, now to the fun part. Visit MarkerPOP's blog and leave a comment because one lucky winner will receive 2 digis of their choice! And just to add to today's exciting news, we will be launching a bimonthly sketch challenge starting this Saturday. The winning prize is a 15% off coupon to A Random Fan shop. Please see our challenge rules for details. Hope Everyone have a great weekend and happy crafting! I would love to win "Travel Bug"! It's so cute. Thanks for a chance to win! Love your company. Monet the Mermaid is my Fave digi and I entered your challenge yesterday using her! congrats on the stamp line!!! It is hard to choose one stamp. They are all so adorable. Oh how cool is Random Fun digis they are gorgeous and I particularly love Miss Sassy but it was hard to choose which one I liked best as they are all just amazing. Hugs Andrea. Wow, your designs are adorable. I'm so glad I saw your blog/shop info at marker pop as I think these will become a new favorite to color.. I am brand-new to your blog from MarkerPop. Your images are really cute!! I told MarkerPop that my favorite of the new ones is Little Miss Sassy. But I am just loving yours!!! Congrats on the new stamps!!! Love the little miss sassy image!!! Yay i love rubber stamps and ever since i saw the new releases on MakerPOP i felt in love with your stamos, they are so sticking cute, and i look forward to more rubber stamps coming up. Thanks for the chance to win! I love Travel bug. I like to travel and this would fit my life. The other stamps are cute too. Hate to leave them out.